Steven Raichlen turns out some mighty great food. I love the tv shows he did – he got me interested in grilling and smoking. And I love the many books he has written. One of the biggest, thickest recipe books you can find is Steven’s BBQ USA. 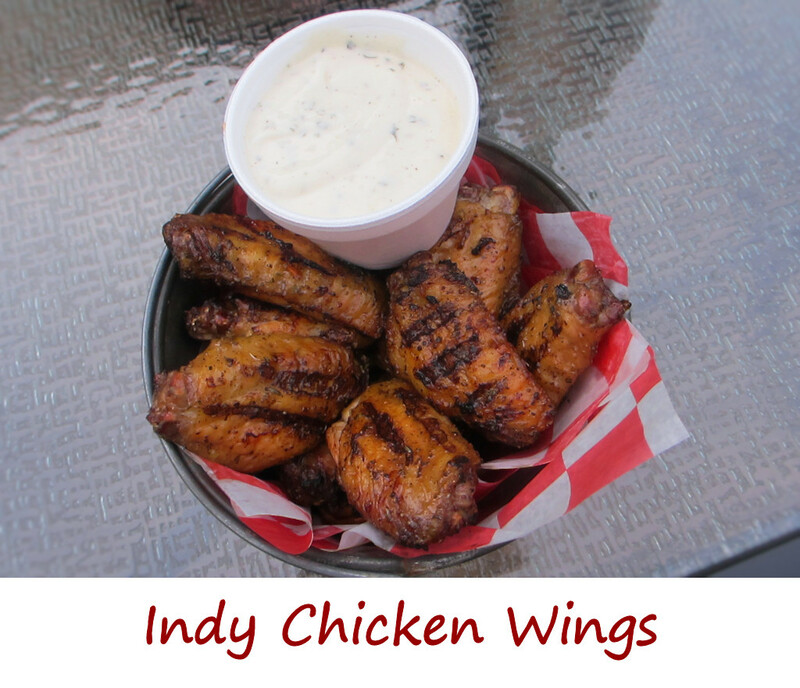 It is absolutely chock full of great foods and stories, like these Indy chicken wings. And since I live in Indy, I had to make them. Well that and because they sounded (and are) fantastic. We really enjoyed these Indy chicken wings. The seasoning has a nice garlicky celery flavor. I used our Italian vinaigrette for basting. It has great Italian herb flavor, with a hint of citrus. Note that the vinaigrette does contain oil, so it can cause flair-ups when cooking the wings on the grill. Also try my very popular Mambo wings! I absolutely love chicken wings, cooked any way, with any sauce (or without). I love them so much that I created a free eCookbook that is full of my favorite wing recipes. Place wings in a large resealable bag or container. Add oil. Seal and toss to coat. Combine the garlic salt, celery seed or celery salt and pepper. Add to container, seal, and toss to coat. Place wings in fridge for at least 2 hours, to overnight. Begin cooking wings as desired. Click here for our guide on cooking wings in a grill, smoker, deep fryer, oven, or a Char-Broil Big Easy. After 15 minutes of cooking begin basting the wings with the Italian vinaigrette. Continue basting every 10 minutes until the wings are done. NOTE: The vinaigrette contains oil, which can cause flair-ups on a grill. Be careful when basting and do not over-baste the wings. If a flair-up does occur move the wings to another part of the grill until the flames die down. This entry was posted in Chicken Wings and tagged Indianapolis, Indianapolis Chicken Wings, indy, Indy Chicken Wings, recipe, steven raichlen, wings by Mike. Bookmark the permalink.